or more resilient than McGillivray. 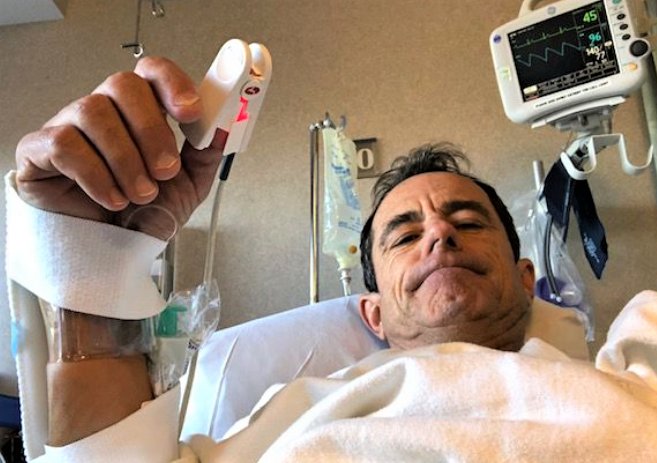 (10-18) Friday morning, Boston Marathon race-director and uber-endurance and charity runner Dave McGillivray will undergo open-heart surgery. Please join us in wishing him well. We fully expect to see him back to his usual tricks in Hopkinton and Boston next April. McGillivray is widely known for his stamina, compassion, and organizational skills, but we believe his most admirable trait is his candor. Dave doesn't duck questions; he answers fully and truthfully. This has become particularly clear in recent years as he has discussed his personal health challenges. Career/profession? I am the founder and owner of DMSE Sports, Inc. (38 years - event management company and have directed or consulted on over 1,100 events), and I am the Race Director of the BAA Boston Marathon (have been with the BAA for over 31 years). hoping to be a baseball player or basketball player but I was always getting cut or never really being picked even by my friends. So, I started running instead. I joined the North Medford Club at age 12 because Fred Brown lived around the corner from me and always saw me running and suggested I join his club. At the time, I was the youngest member ever. Peak running? In the 70’s and 80’s, I was averaging about 120-130 per week. 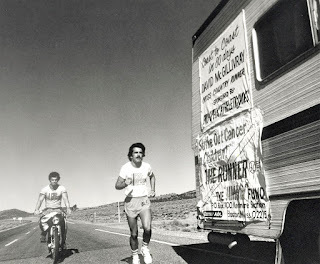 When I ran across the country in 1978, I was averaging 300-350 miles a week. Back then, we always thought more was better. I am second guessing all that now although I’m one of the lucky ones who have seemed to have gotten away with it pretty much unscathed. Top performances? Marathon – 2:29:58. 10K – 31:10. Half Marathon – 1:13. 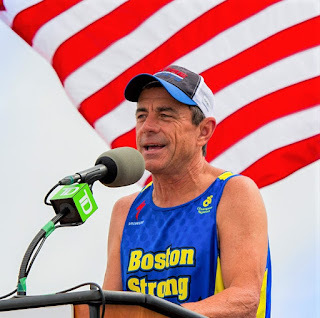 Running achievements – I’ve run 155 competitive marathons, Boston 46 times in a row; Run Across America in 1978 solo and again in 2004 as a relay; Run up the East Coast in 1981. World Marathon Challenge in 2018. Have done 9 Hawaii Ironman Triathlons. Have run my age on my birthday for the last 52 years (2 years I biked a little of it). I’ve done a 24-hour run, a 24-hour bike, a 24-hour swim. And on and on. 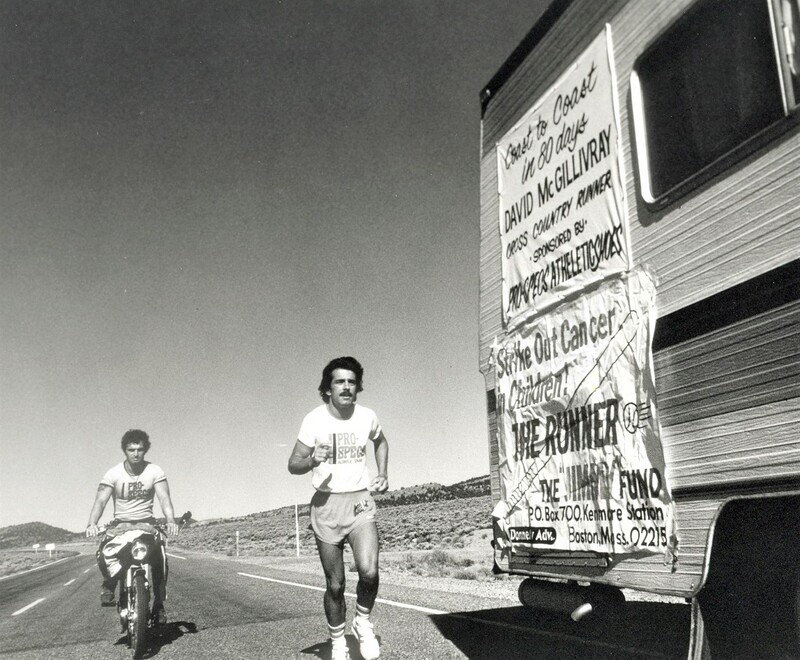 McGillivray first ran across the U.S.
Current running? In 2017, I was doing close to 100 per week again getting ready for 777 [7 marathons, 7 continents/7 days.] Now I'm only running 3-5 miles a day getting ready for open heart bypass surgery on Oct. 12! Recent race results? I do still run races, but in the past six months, knowing I have health issues, I haven’t actually “raced” much. My doctor warned me, “no sprinting across any finish lines,” and I have heeded his advice. In 2014, I was running 6:15 to 6:30 pace for 5K and 10K. Now I'm taking it easy until I get through surgery. My hope is that once this is taken care of, I can get back to running around a 7 minute pace for 5K. What training routine currently works best for you? I am a morning person, so I always feel so much better working out early in the morning than any other time. I’m only running about 30-40 miles a week right now as compared to 75-100 last year at this time. Does it bother you that you are slower now? Unfortunately, it does but I deal with it. I don’t need to be told “well, at least you're alive and running.” I get that. However, it still bothers me a bit (just being honest) that I am running so slow (relatively speaking). That is just the competitive nature in me. I have “accepted it,” but that doesn’t mean it isn’t a little frustrating. I honestly do say to myself how fortunate I am to still be able to do this and do so somewhat competitively within my age group. I am one of the lucky ones. How much did you weigh in your prime? Now? My racing weigh was generally around 135-138 lbs. I now weigh between 139 -144 lbs. I actually want to lose about 10 lbs. over the next 3-4 months. Directing races is what he does. What kind of diet have you followed through the years? Has it changed as you got older? It wasn’t too good up until five years ago. I believed if the furnace was hot enough, it would burn through everything. However, that all caught up to me five years ago when I was diagnosed with severe coronary artery disease. I then changed my diet and eliminated all the bad stuff. I focused on how I ate as much as what I ate. I haven’t eaten anything unhealthy in these past five-years. I’ve been told that I have actually reversed my coronary artery disease in some arteries. Do your currently take any vitamins, minerals, or supplements that you believe contribute to your running and fitness? I do take daily nutritional supplements called LifePak Nano, which is a nutritional anti-aging program formulated to nourish and protect cells, tissues, and organs in the body. What injuries or other health issues have you faced through the years? How have you dealt with these? Orthopedically, I’m doing pretty good. Like everyone my age (64) who has been running for over 50 years (I’m at 52 years), I have my little, nagging aches and pains but nothing debilitating. I’ve learned to back off a little when they present themselves and to treat them conventionally. Other exercise, strength training, stretching? In the middle of my running career, I switched over to triathlons, thus, did a lot of swimming and biking in addition to the running. I truly think that is what helped prolong my runner career. I still do all three with some weight training and basic isometric exercises. I didn’t do much stretching early on, but I do it all the time now. I think it really helps. Some of the tightness is caused by the statin drugs I take. My doctor once asked me, "Would you rather have clogged arteries or tight hamstring?" I hesitated on that one before answering him. Why do you keep running? Number one, health and fitness. Number two, I still like the competitive spirit. Number three, it makes me feel good about myself. Number four, I do my best work and thinking when I am out running on the road. I always carry a voice recorder and record all my best thoughts from the road. I don't think I could direct the Boston Marathon without the creative ideas that come to me while running. Getting heart tested in the hospital. 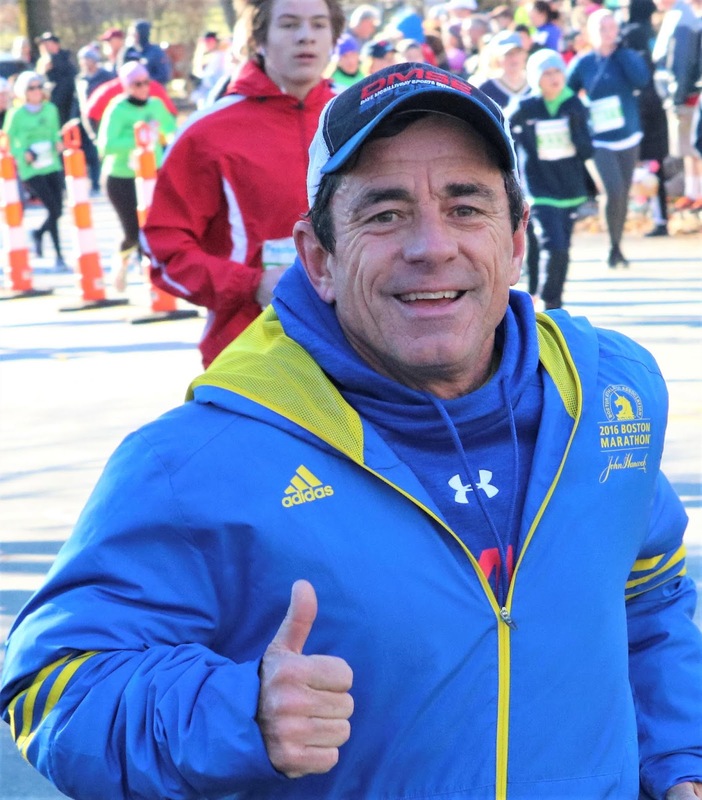 What is your philosophy of life, running, and aging? We all woke up this morning. Not everyone else did. Every day is a gift, make the most of it. I will continue to run until I simply run out of time. As for aging, I’ve always felt that old age is always 15 years older than me. What principles do you follow to maintain your lifetime running habit? I want to live without regrets. Every day that goes by is gone forever. My goal is to be the fittest possible person I can be (and now the healthiest, too) and running gives me the best chance to accomplish this. What are the biggest lessons (life lessons and running lessons) you have learned from running? That the most important person on the planet is you. I once thought going out for a run was somewhat selfish, leaving my family behind and doing something just for me. Now I’ve learned that it is in fact unselfish. We are taking care of ourselves so that we can take care of others, and also to keep others from the burden of caring for us. Who or what inspires you to continue running and maintaining your fitness? The mirror does. Every time I look into it, I want to look like yesterday, not tomorrow. I work hard at that in all facets of my life. People can say, “Hey, you look great” but the mirror doesn’t lie. If I notice one slip in the mirror, it just motivates me to work even harder.